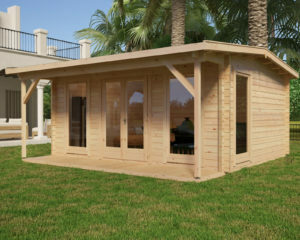 We are proud to have the best choice of garden rooms in Spain! 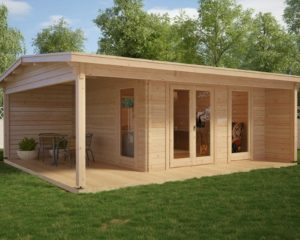 In our extensive range of wooden buildings, you can find over 100 garden log cabin models to choose from. 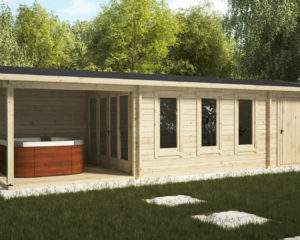 Our garden rooms are designed for quick and easy 1-3 day self-assembly, depending on your skills and cabin size, but we also offer professional cabin installation services. 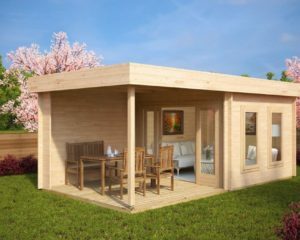 Each cabin comes with 28-70mm thick wall planks (see individual product details), glazed doors and windows, impregnated foundation planks, floor and roof boards, roofing felt, storm braces as well as all screws, nails, fixings and other components to have your garden room built. Due to our long traditions and incredible experience, we are proud to offer 100% top quality summer houses and log cabins. 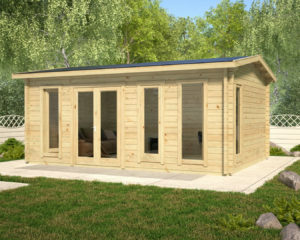 All our garden buildings come with a five-year guarantee. Our customer service is open from Monday to Saturday 10:30 – 18:30 and Sundays 11:00 – 18:00. Delivery and installation in all parts of Spain. All our wooden buildings are made of sustainably sourced slow grown Nordic spruce. This is one of the most durable and long-lasting woods to build from. 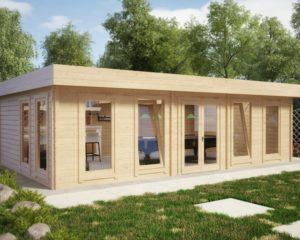 All wooden cabin components, except impregnated foundation planks and terrace boards, are natural and have not been chemically treated. 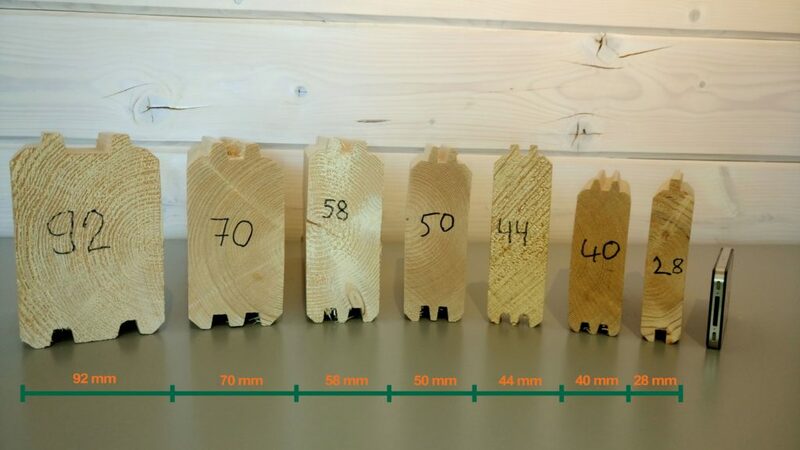 Wood is a so called “live” material, and therefore swelling and shrinking of wooden components during the first year after assembly is common to all timber buildings. 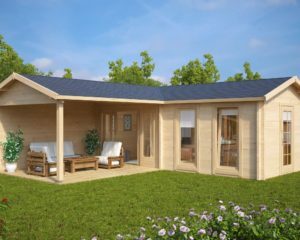 Each log cabin settles during the first year and it is important to avoid any pressure or barrier that will impede the cabin from settling down completely. Common problems which arise if the cabin is unable to settle freely are gapping between the wall planks and poor functionality of doors and windows as well as decreased stability and life span. Vertically installed and screwed metal or plastic conduit or pipe covers from floor to ceiling as well as making the canopy supports too tall are the most frequent mistakes in our experience. Knots and small cracks are also natural to wood, and are not a subject of complaint. It is also important to treat your cabin with wood preservative or paint as soon as the cabin has been installed. This will prevent your cabin from becoming grey and rotting, and finally it will keep your cabin looking nice for years and years to come and extend its life span four-fold. Wall thickness is one of the most important, if not the most important cabin feature and price determining factor. 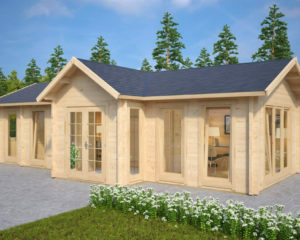 The price of two very similar cabins with an almost identical look, but with the only difference being wall thickness may vary significantly. 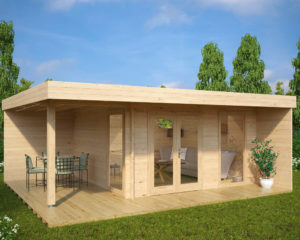 If the cabin walls are three times thicker, three times more wood has been used. Although the appearance on the product images is almost identical, the final outcome is absolutely different. Thicker walls result in more strength and stability, significantly longer life span and decrease the impact of outside weather conditions. 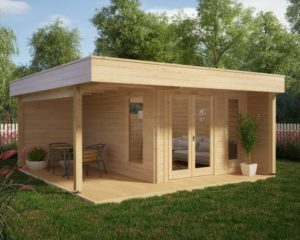 Most commonly used wall thicknesses for garden rooms are 28mm, 40mm, 44mm, 58mm and 70mm. 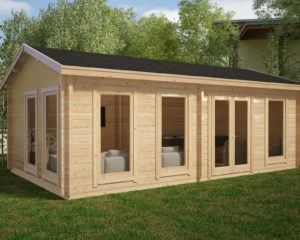 Generally speaking, 28mm single tongue and groove wall planks are good for small 2x2m, 2x3m and up to 3x3m sheds and summer houses with a life expectancy of around 6-7 years. If you are looking for something firmer and more durable, we would recommend you go for 40mm double tongue and groove wall planks. 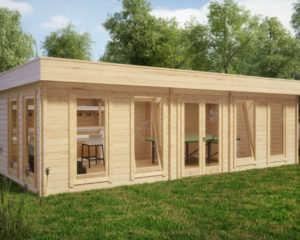 We use 40mm wall planks for up to 15m2 garden buildings. 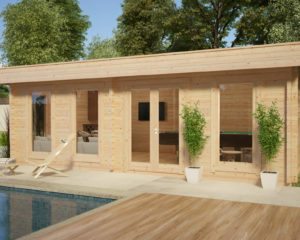 44mm and 58mm wall planks ensure great stability and a long life span for 4x4m / 4x5m cabins and 58mm up to 5×5, 4x7m and even larger timber buildings. Finally, 70mm wall planks are firm enough for almost any sized garden building and even for a 100m2 residential log cabin. 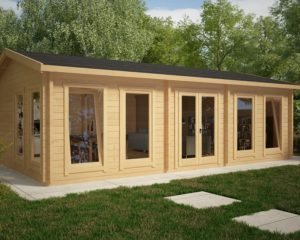 Garden buildings are usually bought for setting up a garden room for relaxing, socializing and hosting garden parties, a garden studio for doing your hobbies, garden office to work in, gym for workout and fitness, games room for playing table tennis, pool or snooker and the list can go on and on. But, there is almost always a need for garden storage and a shelter for hiding from the sun or rain. 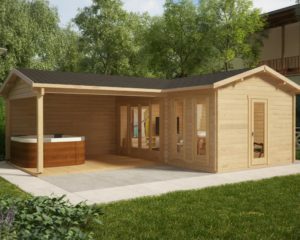 For this purpose, we have a decent number of so called multifunctional garden buildings: garden rooms with spacious verandas, a garden room and shed combined, garden room with workshop combined, two and three room garden log cabins as well as garden room, shed and veranda all combined in one building. 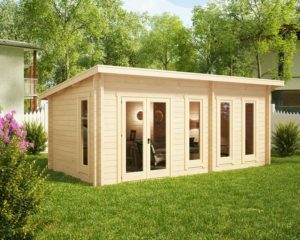 These types of buildings are very widely used in gardens with limited space, because they help you to save lots of space. 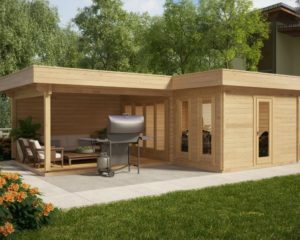 Besides the space in your backyard, these cabins save a good you money, compared to buying several garden buildings to get all these functions. Different log cabin manufacturers use different standards for cabin doors and windows. Our door and window quality are something that we can be very proud of. This is also one of the cabin features that you don’t see on the product image, but in reality, it plays a very big role in usability as well as in cabin price. Three main factors are doors and window locks, hinges and handles, glazing type (single or double glazing) as well gaskets to ensure proper weather resistance. We use basic locks, hinges and handles for all low budget 28mm and 40mm cabins. 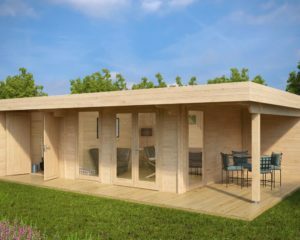 These cabins come with singles glazed windows that can be either tilted or opened entirely depending on the model. 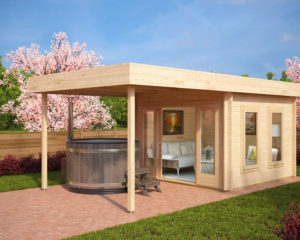 All our cabins with wall planks of 44mm and above have double glazed doors and windows in the standard kit and almost all of them have German made Roto “Turn & Tilt” systems to be able to open the windows entirely, as well as tilt from above for ventilation. Roto systems make doors and windows very convenient and user friendly and will provide security and reliability for several times longer than most other systems on the market. 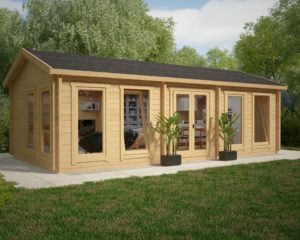 When you buy your garden room from Casetas De Jardin 24, you can be sure you will get a garden room with the best possible doors and windows you can find on the entire Spanish market! 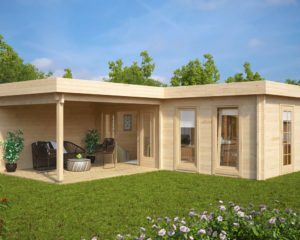 Our garden buildings have been designed for self-assembly and they are fairly easy to install without using professionals. All components are included in the cabin kit as well as very detailed plans and assembly instructions. All you need are previous DIY skills, good understanding of what you are doing as well as tools, such as handsaw, screw driver, rubber mallet, hammer, level, tape measure, drill, knife, a pair of pliers, and a ladder. But be honest with yourself, if you haven’t installed home furniture or a garden building before and you struggle with putting a nail in the wall properly, you should involve someone with previous experience, use a local carpenter or order a cabin together with our professional installation services! Mistakes made due to lack of skills are usually time consuming and expensive to fix and may lead to voided Casetas De Jardin 5-years factory guarantee. Any cabin can only be installed on a proper base. This is where the building starts and a good level base will help ensure the rest of the cabin assembly goes smoothly. Poor foundations will result in warped and twisted walls, non-function doors and windows, decreased stability and decreased life span. There are many good base types to prepare, many of which are simpler than you may think. 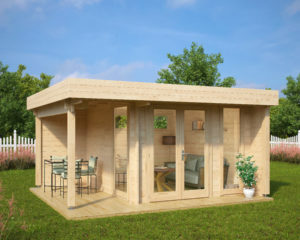 The most popular base types for small and medium sized garden rooms are adjustable riser pedestals or breeze blocks on to gravel, as well as ground screw foundations. These three types are easiest to prepare and they are the most cost efficient at the same time. The most durable, firm and probably the best foundation type is a concrete slab base and it can be made to fit to any size building. This is also the most expensive and complicated base type to build. 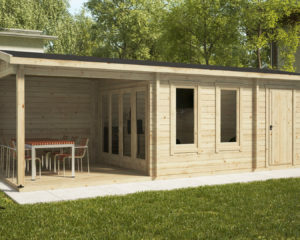 Alternatively, you can install a garden room on paving slabs or build a concrete pier or concrete strip foundation. All cabin components are packed with the highest care into durable and water proof membrane to ensure that everything is delivered in A1 condition. 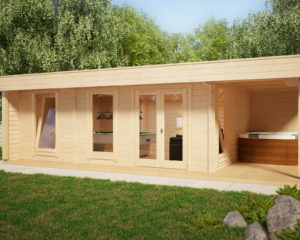 Most of our cabins under 20m2 are delivered in one package. It is usually up to six meters long and weighs up to 2000kg. Package width is always 1,2m and the height between 50 and 100cm. Larger cabins are delivered in several packages. 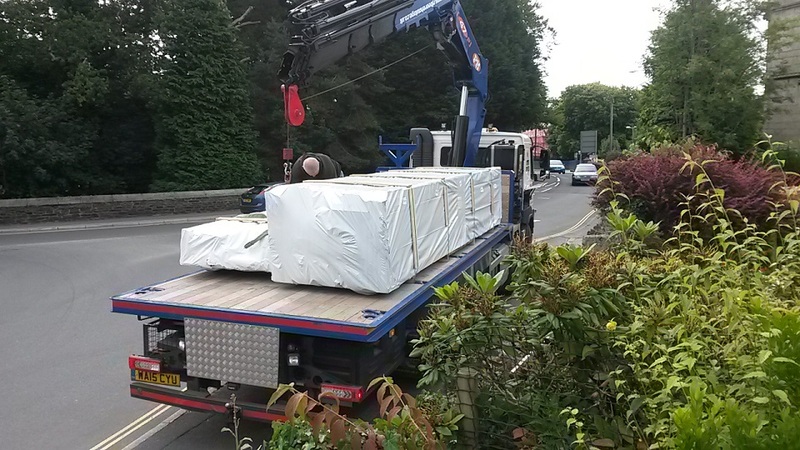 All home deliveries are made on Hiab crane trucks which must be able to unload these heavy packages safely. It is important that you notify us of any access restrictions to your property prior to ordering. “My garden, my rules” is not how it works with installing a garden room, guest house or shed in your garden. Restrictions and requirements vary significantly in different areas of Spain (Municipio). Never build or even order any log cabin or garden building, however small before you have been cleared by your local administration.